Start your year with a Social Contract. 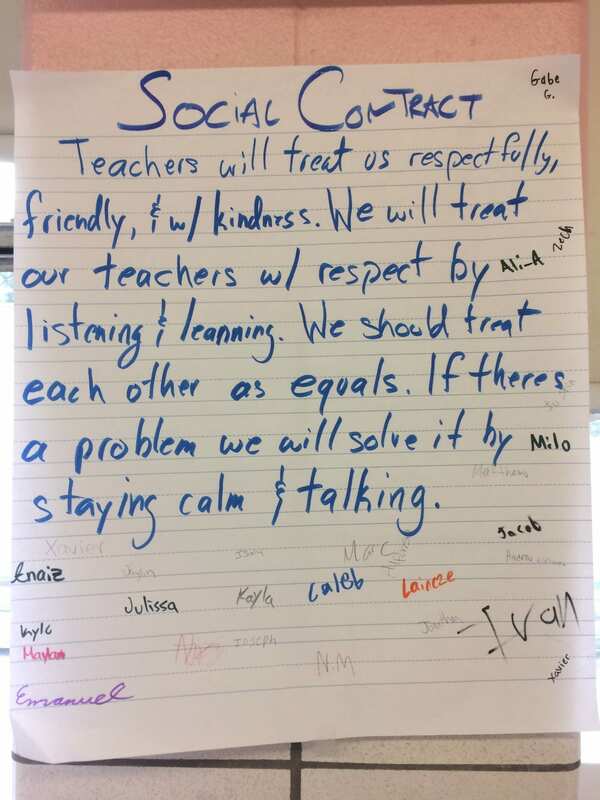 Different from a set of classroom rules, a contract is an agreement created by the students for both how they want to be treated and how they should treat others. Establish a culture that is unique to your classroom, based on the values of those in it. 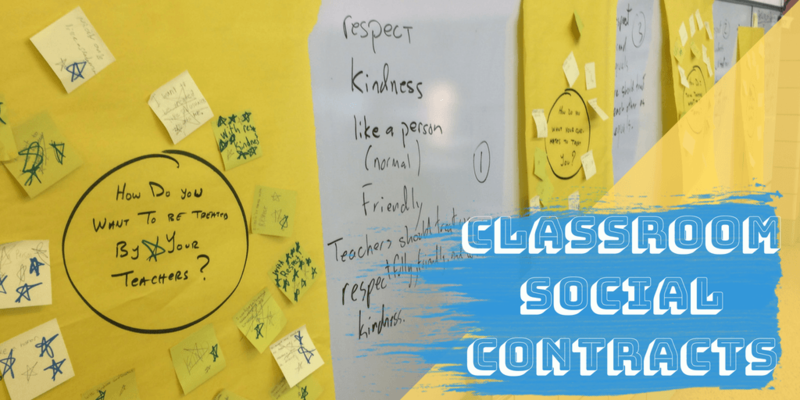 While not yet a household name, the social contract has been an emerging trend in the world of education for sometime now. In essence a social contract theory to allows the students create their own constitution, encouraging student ownership of their education. It provides them with a practical tool to create a classroom environment that will foster their education. Students learn the value of arguing for their views, as they quickly see that giving an opinion without a good reason often carries little weight with their peers. Students often carry this lesson with them into subsequent discussions throughout the course. Students also learn autonomy and responsibility because the lesson turns students into legislators for their course. They, thereby, see what it means “to be a law unto themselves,” instead of having rules imposed upon them. They also see the need to take personal responsibility for the rules that they have written. 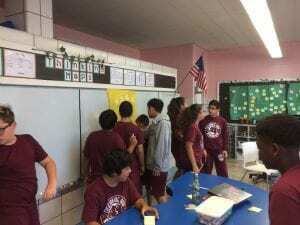 Its important that the students voice is the driving force behind the contract; by doing so you’re separating it from the traditional list of teacher mandated rules posted around the room. To be clear this is not a list of rules at all, but rather an agreement of how to treat the members of the classroom community. You don’t want to get bogged down in specifics or procedures – this isn’t a place to discuss how to push in your chair or line order, but rather generalities and guidelines of social interactions. It should also be short, accessible, and written in a language created by students. To scaffold this, our campus centered or social contract around four main questions. -How do you want to be treated by the teacher? -How do you think the teacher wants to be treated? -How do you want to treat each other? -How should we handle conflict? I created four large poster papers hung around the room with these exact questions on them. I asked my middle schoolers to think about them, and write down just one word answers on small post-its. When they had an answer they were to walk up to the chart paper and stick it. I gave them about 5 minutes until everyone has submitted at least one note to each poster. Next we did a gallery walk, where each student walked around the room reading the answers of others. If they liked or agreed with another student’s note they could draw a start next to it. Finally I moved all the note to a white board, and jotted down the top 4 or 5 words (ie the words with the most stars) and then asked the students if they wanted to add anything before moving on. After doing this for all 4 posters – we had a list of key words that we would use to form our contract. As a class we constructed sentences around the question using the key words, and then with student input ordered the sentences in a way we felt that was meaningful (fun at the end they said!). After this, I had a student (who volunteered) write our sentences on a big piece of chart paper and then I hung it in the front of the room. 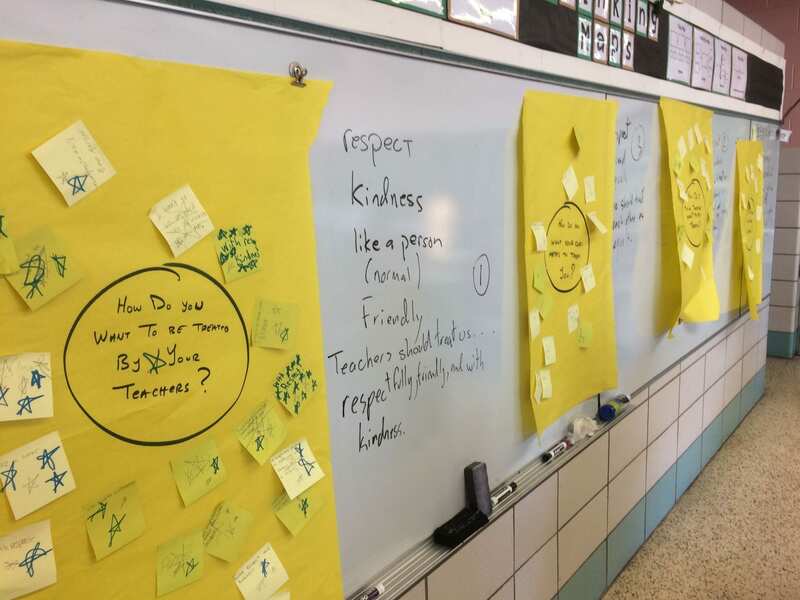 We read through the contract together, and then one by one students came up and signed it – then I signed it – and anyone who will be doing work in our classroom will sign it. This is our rooms social contract all everyone, including adults, are beholden to it. The fact that adults are following student created rules really helps with their investment and buy in. Throughout the year we can reference the contract, when discussing behavior, attitudes, work ethic etc. However, it’s important to note this should be a living document revisited and updated periodically as you see fit. If you make one in August, consider updating it when you return from Winter break. I’ve seen this approach work wonders in individual classrooms and I’m excited to try it now as a school wide initiative. If you’re interested in reading more on this topic, or want as more detailed walkthrough I found this PLATO article to be extremely helpful.